BPMN is the industry standard for business process modeling, whether for simple documentation, analysis, or executable implementation. Today anything else should be considered “legacy” and “proprietary.” The challenge is to use BPMN correctly and effectively, clearly and consistently through the process diagram alone. BPMessentials shows you how to be able to communicate the process logic clearly. A methodology for consistent process modeling, a cookbook recipe for going from a blank page to a complete, properly structured, end-to-end process model. A set of conventions that go beyond the rules of the (OMG-) specification to ensure that the modeler’s intent is clear from the printed diagram alone. Originally taught as best practices, BPMN style is now taught as a set of rules that can be validated in one mouse click. VIZI BPM SUITE supports a built-in style rule validation. Hands-on practice is essential! Visit BPMessentials.com for further information. 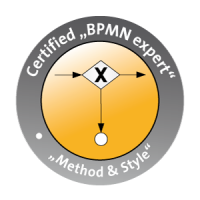 BPMessentials certification demonstrates not only the understanding of BPMN 2.0 standard but the ability to create process diagrams that are clear, complete, and consistent with “Method and Style” principles. The cost of certification is built into the training.